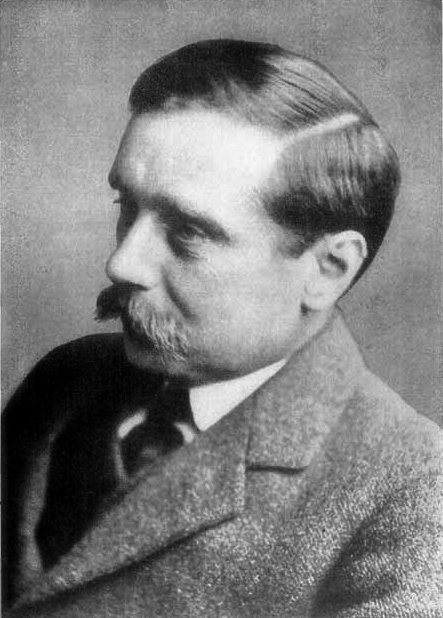 Thirteen years before the start of the Great War, British author and futurist H. G. Wells predicted the European Union, tarmac roads, wind farms, tanks, motorways, sexual liberation and not just the internet but specific parts of the internet, including Mail Online. 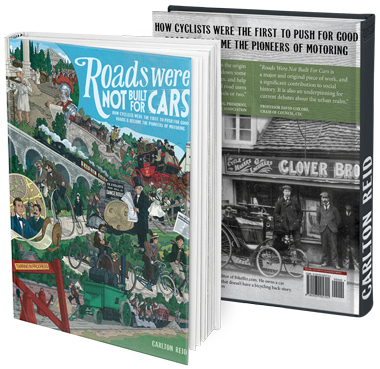 He assumed that motorcars would take over the world but bicycles wouldn’t disappear: in fact, they’d get special tracks. Yes, Herbert George Wells knew about the existence of Sustrans before John Grimshaw. If we can ignore Wells’ racism – “The Jew is mentally and physically precocious, and he ages and dies sooner than the average European, but in that…he is simply on all fours with the short, dark Welsh. He foregathers with those of his own nation, and favours them against the stranger, but so do the Scotch,” – we can see him as a thinker who was far ahead of his time. In 1901 he wrote Anticipations of the Reaction of Mechanical and Scientific Progress Upon Human Life and Thought, a futuristic vision of life fifty and a hundred years hence. His predictions were very good, and he certainly had more hits than misses. His misses include the popularity of heavier-than-air flight and he assumed we’d have less servants in the future, not none at all. What follows are some of his predictions. The headers are mine. There will, first of all, be the motor truck for heavy traffic. Already such trucks are in evidence distributing goods and parcels of various sorts. And sooner or later, no doubt, the numerous advantages of such an arrangement will lead to the organization of large carrier companies, using such motor trucks to carry goods in bulk or parcels on the high roads. The motor omnibus companies competing against the suburban railways will find themselves hampered in the speed of their longer runs by the slower horse traffic on their routes, and they will attempt to secure, and, it may be, after tough legislative struggles, will secure the power to form private roads of a new sort, upon which their vehicles will be free to travel up to the limit of their very highest possible speed. It is along the line of such private tracks and roads that the forces of change will certainly tend to travel, and along which I am absolutely convinced they will travel. This segregation of motor traffic is probably a matter that may begin even in the present decade. Once this process of segregation from the high road of the horse and pedestrian sets in, it will probably go on rapidly. Their traffic in opposite directions will probably be strictly separated…where their ways branch the streams of traffic will not cross at a level but by bridges. It is easily conceivable that once these tracks are in existence, cyclists and motors other than those of the constructing companies will be able to make use of them. And, moreover, once they exist it will be possible to experiment with vehicles of a size and power quite beyond the dimensions prescribed by our ordinary roads — roads whose width has been entirely determined by the size of a cart a horse can pull. At present the streets of many larger towns, and especially of such old-established towns as London, whose central portions have the narrowest arteries, present a quite unprecedented state of congestion. When [a historian] comes to review our times…he will be struck first of all by the omnipresence of mud, filthy mud, churned up by hoofs and wheels under the inclement skies, and perpetually defiled and added to by innumerable horses. “Just where the bicycle might have served its most useful purpose,” he will write, “in affording a healthy daily ride to the innumerable clerks and such-like sedentary toilers of the central region, it was rendered impossible by the danger of side-slip in this vast ferocious traffic.” And, indeed, to my mind at least, this last is the crowning absurdity of the present state of affairs, that the clerk and the shop hand, classes of people positively starved of exercise, should be obliged to spend yearly the price of a bicycle upon a season-ticket, because of the quite unendurable inconvenience and danger of urban cycling. Many people living at the present time, who have grown up amidst the exceptional and possibly very transient characteristics of this time, will be disposed to regard the traffic in the streets of our great cities as a part of the natural order of things, and as unavoidable as the throng upon the pavement. But indeed the presence of all the chief constituents of this vehicular torrent — the cabs and hansoms, the vans, the omnibuses—everything, indeed, except the few private carriages — are as novel, as distinctively things of the nineteenth century, as the railway train and the needle telegraph. The streets of the great towns of antiquity, the streets of the great towns of the East, the streets of all the mediæval towns, were not intended for any sort of wheeled traffic at all — were designed primarily and chiefly for pedestrians. So it would be, I suppose, in any one’s ideal city….It is the growth in size of the city that has necessitated the growth of this coarser traffic that has made “Town” at last so utterly detestable. I do not see what is to prevent the process of elimination that is beginning now with the heavy vans spreading until it covers all horse traffic, and with the disappearance of horse hoofs and the necessary filth of horses, the road surface may be made a very different thing from what it is at present, better drained and admirably adapted for the soft-tired hackney vehicles and the torrent of cyclists. And, after all, for all such “shopping” as one cannot do by telephone or postcard, it will still be natural for the shops to be gathered together in some central place. Bond Street and Regent Street…and Broadway will still be brilliant and crowded for many years for all the diffusion that is here forecast — all the more brilliant and crowded, perhaps, for the lack of a thronging horse traffic down their central ways. But the very fact that the old nucleus is still to be the best place for all who trade in a concourse of people, for novelty shops and art shops, and theatres and business buildings, by keeping up the central ground values will operate against residence there and shift the “masses” outwardly. And dotted at every convenient position along the new roads, availing themselves no doubt whenever possible of the picturesque inns that the old coaching days have left us, will be wayside restaurants and tea houses, and motor and cycle stores and repair places. Through the varied country the new wide roads will run, here cutting through a crest and there running like some colossal aqueduct across a valley, swarming always with a multitudinous traffic of bright, swift (and not necessarily ugly) mechanisms… Ever and again there will appear a cluster of cottages, with the smoky chimney of to-day replaced by a…windwheel or waterwheel to gather and store the force for the machinery… There is no reason why the essential charm of the country should disappear; the new roads will not supersede the present high roads, which will still be necessary for horses and subsidiary traffic; and the lanes and hedges, the field paths and wild flowers, will still have their ample justification. The lack of ingenuity in sanitary fittings at present forbids the obvious convenience of hot and cold water supply to the bedroom, and there is a mighty fetching and carrying of water and slops to be got through daily. All that will cease. Every bedroom will have its own bath-dressing room which any well-bred person will be intelligent and considerate enough to use and leave without the slightest disarrangement. Downstairs a vast amount of needless labour at present arises out of table wear. “Washing up” consists of a tedious cleansing and wiping of each table utensil in turn, whereas it should be possible to immerse all dirty table wear in a suitable solvent for a few minutes and then run that off for the articles to dry. Will a generation to whom marriage will be no longer necessarily associated with the birth and rearing of children, or with the immediate co-operation and sympathy of husband and wife in common proceedings, retain its present feeling for the extreme sanctity of the permanent bond? Will the agreeable, unemployed, childless woman, with a high conception of her personal rights, who is spending her husband’s earnings or income in some pleasant discrepant manner, a type of woman there are excellent reasons for anticipating will become more frequent — will she continue to share the honours and privileges of the wife, mother, and helper of the old dispensation? And in particular, will the great gulf that is now fixed by custom between her and the agreeable unmarried lady who is similarly employed remain so inexorably wide? One gets used to literary booms just as one gets used to motor cars, they are no longer marvellous, universally significant things, but merely something that goes by with much unnecessary noise and leaves a faint offence in the air. There is every possibility of papers becoming at last papers of world-wide circulation, so far as the language in which they are printed permits, with editions that will follow the sun and change into to-morrow’s issue as they go, picking up literary criticism here, financial intelligence there, here to-morrow’s story, and there to-morrow’s scandal, and, like some vast intellectual garden-roller, rolling out local provincialism at every revolution. This, for papers in English, at any rate, is merely a question of how long it will be before the price of the best writing (for journalistic purposes) rises actually or relatively above the falling cost of long distance electrical type setting. Each of the local editions of these world travelling papers, in addition to the identical matter that will appear almost simultaneously everywhere, will no doubt have its special matter and its special advertisements. Illustrations will be telegraphed just as well as matter, and probably a much greater use will be made of sketch and diagram than at present. [Daily] papers may presently give place to hourly papers, each with the last news of the last sixty minutes photographically displayed. As a matter of fact no human being wants that, and very few are so foolish as to think they do; the only kind of news that any sort of people clamours for hot and hot is financial and betting fluctuations, lottery lists and examination results; and the elaborated and cheapened telegraphic and telephonic system of the coming days, with tapes (or phonograph to replace them) in every post-office and nearly every private house, so far from expanding this department, will probably sweep it out of the papers altogether. One will subscribe to a news agency which will wire all the stuff one cares to have so violently fresh, into a phonographic recorder perhaps, in some convenient corner. There the thing will be in every house…to hear or ignore. [Newspapers will] classify their advertisements in a descending scale of freshness and interest that will also be an ascending scale of price. The advertiser who wants to be an indecent bore, and vociferate for the ten millionth time some flatulent falsehood about a pill, for instance, will pay at nuisance rates. Probably many papers will refuse to print nasty and distressful advertisements about people’s insides at all. One can conceive [guns will be] provided in the future with cross-thread telescopic sights, the focussing of which, corrected by some ingenious use of hygroscopic material, might even find the range, and so enable it to be used with assurance up to a mile or more. It will probably also take on some of the characters of the machine-gun. It will be used either for single shots or to quiver and send a spray of almost simultaneous bullets out of a magazine evenly and certainly, over any small area the rifleman thinks advisable. It will be slung with its ammunition and equipment upon bicycle wheels. For a time quite possibly there will be no definite army here or there, there will be no controllable battle, there will be no Great General in the field at all. But somewhere far in the rear the central organizer will sit at the telephonic centre of his vast front, and he will strengthen here and feed there and watch, watch perpetually the pressure, the incessant remorseless pressure that is seeking to wear down his countervailing thrust. Behind the thin firing line that is actually engaged, the country for many miles will be rapidly cleared and devoted to the business of war, big machines will be at work making second, third, and fourth lines of trenches that may be needed if presently the firing line is forced back, spreading out transverse paths for the swift lateral movement of the cyclists who will be in perpetual alertness to relieve sudden local pressures, and all along those great motor roads, there will be a vast and rapid shifting to and fro of big and very long range guns. Long before the year a.d. 2000, and very probably before 1950, a successful aeroplane will have soared and come home safe and sound. Directly that is accomplished the new invention will be most assuredly applied to war. Small bodies of cyclist riflemen would rush forward to meet the advancing clouds of cavalry, would drop into invisible ambushes, and announce their presence—in unknown numbers. A small number of such men could always begin their fight with a surprise at the most advantageous moment, and they would be able to make themselves very deadly against a comparatively powerful frontal attack. If at last the attack were driven home before supports came up to the defenders, they would still be able to cycle away, comparatively immune. The clouds of cavalry would have to spread into thin lines at last and go forward with the rifle. Invading clouds of cyclists would be in no better case. A conflict of cyclists against cyclists over a country too spacious for unbroken lines, would still, I think, leave the struggle essentially unchanged. Experiments will probably be made in the direction of armoured guns, armoured search-light carriages, and armoured shelters for men, that will admit of being pushed forward over rifle-swept ground. To such possibilities, to possibilities even of a sort of land ironclad, my inductive reason inclines; the armoured train seems indeed a distinct beginning of this sort of thing, but my imagination proffers nothing but a vision of wheels smashed by shells, iron tortoises gallantly rushed by hidden men, and unhappy marksmen and engineers being shot at as they bolt from some such monster overset. I do not see that the existing Germanic synthesis is likely to prevail in the close economic unity, the urban region that will arise in Western Europe. I imagine that the German Empire — that is, the organized expression of German aggression to-day — will be either shattered or weakened to the pitch of great compromises by a series of wars by land and sea; it will be forced to develop the autonomy of its rational middle class in the struggles that will render these compromises possible, and it will be finally not Imperial German ideas, but central European ideas possibly more akin to Swiss conceptions, a civilized republicanism finding its clearest expression in the French language, that will be established upon a bilingual basis throughout Western Europe, and increasingly predominant over the whole European mainland and the Mediterranean basin, as the twentieth century closes. The splendid dream of a Federal Europe, which opened the nineteenth century for France, may perhaps, after all, come to something like realization at the opening of the twenty-first. An ignorant, a merely trained or a merely cultured people, will not understand these coalescences, will fondle old animosities and stage hatreds, and for such a people there must needs be disaster, forcible conformities and war. H.G. Wells lived near and rode on the “famous Ripley road” and wrote that oft-quoted line in ‘A Modern Utopia’, of 1905. His quote about cycle tracks has long been taken out of context. In his vision of the future, the cycle tracks he talked about were more like scenic Sustrans routes rather than the intra-urban expressways for bicycles that many people assume he meant. “No doubt the Utopian will travel in many ways. [A] thin spider’s web of inconspicuous special routes will cover the land of the world, pierce the mountain masses and tunnel under the seas. These may be double railways or monorails or what not…but by means of them the Utopian will travel about the earth from one chief point to another at a speed of two or three hundred miles or more an hour. And running beside these lighter railways, and spreading beyond their range, will be the smooth minor high roads…upon which independent vehicles, motor cars, cycles, and what not, will go. The quote is a popular one on bike blogs and in newspapers articles by journalists discovering the joys of cycling, but try as I might, I have not been able to track down a source for the quote. If you can verify it from the novels or letters penned by H.G Wells – or from one of his many radio interviews – please get in touch. There was a big push for on-road bicycle sidepaths (now called cycletracks) at the turn of the century in the U.S., so this probably wasn’t a new idea to Wells but one that he thought would continue. Yes, the push for side paths started in about 1897 and some were built. Very narrow mind. Parts of the Great Sidepath were built, plans were for 500 miles from Chicago. In many ways the call for side paths was a recognition that rural roads weren’t being improved (for cyclists, or anybody) and so demo paths should be made. Many were funded by a cycle license fee, about a buck a year. Cyclists were therefore the first to pay for *their* routes. I’m in touch with the leading US academic on side path history.